The Campaign to Defeat Barack Obama, a small-donor PAC, has launched a bus tour to reach conservative voters in hotly contested states, while trying to raise funds to launch an anti-Obama TV ad. As Election Day nears, it sometimes seems that the presidential campaign has boiled down to just three things: the candidates zooming from one battleground state to another, ominous ads pouring forth from the television and unions going door-to-door to drum up votes. But there's another campaign underway, as well â" relatively small-budget, often secretive groups working under the radar to influence voters. Call it the more entrepreneurial side of politics: a few people without much money compared to the big guys, but with something to say that they hope will catch voters' attention. The American Principles SuperPAC launched in August with just six donors. Now, it's put up dozens of highway billboards in Florida that blame President Obama for high gasoline prices. 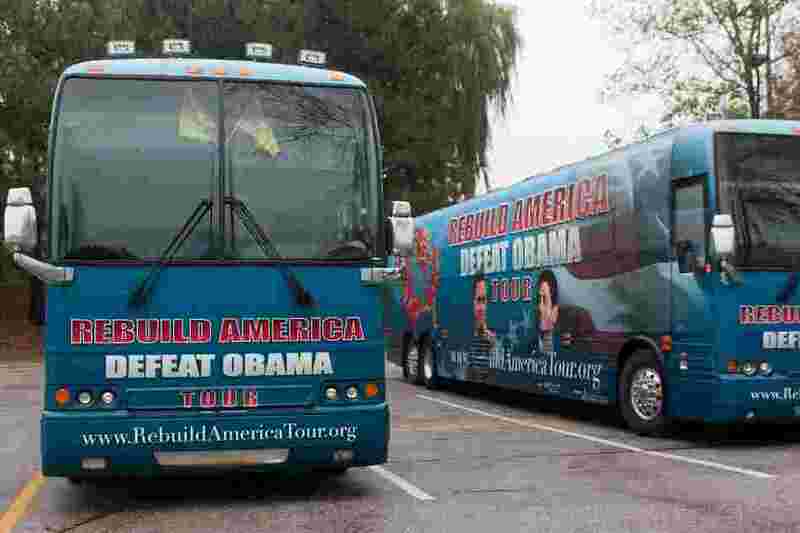 And a small-donor PAC, the 17-month-old Campaign to Defeat Barack Obama, is sending a bus across the battleground states, in what it's calling the "Rebuild America Tour." That's not to be confused with the "Obama's Failing Agenda" bus tour, the multi-million-dollar, secretly funded project by Americans For Prosperity, a group backed by the billionaire Koch brothers and their allies. Ryan Gill, vice president of the Campaign to Defeat Obama, says his group does what the D.C.-based superPACs can't manage â" reach voters on a very local level. "We do rallies where we reach the grassroots directly, Gill says. "Whereas the superPAC model that we hear a lot about these days is much more a few people doing large media buys." Besides the bus tour, the Campaign to Defeat Obama is also asking donors to help get an ad on television. "It's time to retire the beer summit, spring-break presidency," the ad says, over images of the president sipping from pint glasses. "It's time to put the adults back in charge of America." His group's main mission, Gill says, is to mobilize the conservative base. "We're building the energy among the faithful, and getting people more involved and more active to go and turn out votes for Mitt Romney and Paul Ryan," he says. There are dozens of small entrepreneurial efforts like these, primarily on the political right. Donors on the left, in contrast, tend to favor big, established institutions doing battle on social issues, like unions and environmental and women's groups. But there are exceptions, like the social welfare group called Artists and Illustrators for Children. Its 400 members include the authors of The Phantom Tollbooth, The Giver and Ella Enchanted. "Our targets are librarians, teachers, parents who read books to their children, people in the literary community," says author and poet April Halprin Wayland. "We're hoping that the reputation of our members will encourage them to think about, 'Hmm â" if this person, who I respect and whose work I know, really feels like Obama's the best candidate, let me take a look.'" The group's biggest media play â" not that big at all â" came in September, just before TV ad rates went up, airing a TV spot featuring a diverse group of children 35 times in small Florida television markets. If theirs is among the softest of soft sells for President Obama, Dreams From My Real Father may be one of the harshest attacks against him. It's a DVD alleging that the president is the child of an illicit affair, and has spent his life pursuing the Communist goals of his birth father. "You have cracked the code surrounding Obama," says a voiceover in one of the film's trailers. It then cuts to Obama's voice, saying, "The American people will embrace the change," before returning to the voiceover: "...And the true Marxist mission he is on." It's worth noting that the small clip of President Obama was pulled from a 2008 campaign speech, and it wasn't about Marxism. Ironically, he was talking about ending divisive politics. The trailer is available online, but be aware that it contains adult content. Joel Gilbert, the film's writer, director and producer, says 7 million copies of the DVD are being mailed to swing-state voters. "I'm hoping everybody watches it, before Election Day, on Election Day, after Election Day," Gilbert says. But, he says, Dreams From My Real Father isn't intended to influence the election. Instead, he argues, the DVD mailings are meant to make the movie a success. "We're sending them state-by-state, for publicity, to make sure the media will cover it," Gilbert says. "And I'm sure that's why we're talking today." Gilbert says that kind of exposure might lead to a television deal ... or even a book contract.